The following is the second of a multipart series that I will be posting. It is a step by step guide to going Google with a strong connection to the Technology Integration Matrix which provides a framework outlining tech integration from entry level adoption to transformation of learning. Each part of the series will focus on a different Google App and lead teachers through this process. Google Docs (which many of you are familiar with already) has been renamed Google "Drive" which is basically the same tool, but now allows you to work offline/sync with offline work. The Google Drive App focused on in this article is Google Presentations, highlighting some of perks and opportunities available when using this app with students/colleagues. Because technology tools, even as posted in this article, so quickly become obsolete, I ask that readers post updates as to how they have found new uses for these Apps and share their innovative practices. This level of tech integration is defined as replacing one form of technology with another equally effective piece of technology. PowerPoint presentations, which have been around for ages now, can be replaced by Google Presentations, which can make it easier to organize, modify, and share those presentations that took hours to create. The great thing is, that you can easily upload any previous presentation and Google Docs/Drive will convert your presentation with minimal impact. In this stage, students begin to use technology tools independently to construct meaning and understanding of topics. Google Presentations is a great tool to achieve this goal. Presentations can contain prompts and outlines facilitated by the teachers to guide student learning and can be created, modified, and shared with anyone, anywhere. Presentations are developed collaboratively and simultaneously with continuous communication via the "comments" function. This means multiple students can be creating a presentation at the same time, in real time, while having a conversation, while the Presentation updates in real time, all from the comfort of their own homes. Students can begin to construct their own learning, while the teacher provides instant and meaningful feedback while facilitating the creation of meaningful more relevant presentations. The feedback loop becomes more frequent and common and therefore the learning curve and gaps narrowed. In this stage, the teacher facilitates lessons and projects in which students are engaged in higher order learning activities that would not have been possible without the technology tool. The teacher helps students locate appropriate resources to support student choices. The key is transforming learning activities to a level that would not be possible without technology, and specifically in this case, Google Presentations. Outlined below are seven ways users can transform a PowerPoint presentation into a dynamic and collaborative document beyond what has ever been possible, at the Transformation/Goal Directed Level of Integration. Similarly to the possibilities discussed in part one of The Google Papers: Google Documents, Google Presentations has various insert functions that can transform the static, view only, PowerPoint presentation into an interactive, dynamic document. Simply upload any of your .ppts to Google docs, then share them with your students, and you have already achieved the "Entry/Active" level of technology integration and have made a significant step towards transforming the learning environment by enabling students to access course content on their own terms, from anywhere, anytime. are not a dramatically new technology as they have been integrated into websites since the internet launched. Being able to easily insert a Hyperlink into a Google Presentation that can take the viewer anywhere on the web can however take the viewer on a journey while encouraging them to explore more. The view decides where the end destination is and how deep into the content they want to delve. When this really becomes powerful is when links are inserted to course materials such as assignments, projects, activities, and discussions. This can be easily achieved as everything that is uploaded to Google Drive has generates a URL and therefore can be linked within a Google Presentation. When flipping lessons this becomes extremely efficient, powerful, and transformational as students can work their way through course content independently and complete their assignments online as they progress at their own pace. 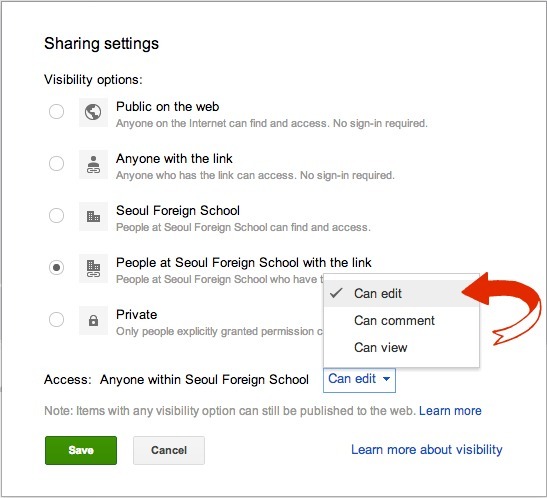 Furthermore, students can collaboratively develop a Google Presentation with this features. Many find the space for text available on presentations limiting. 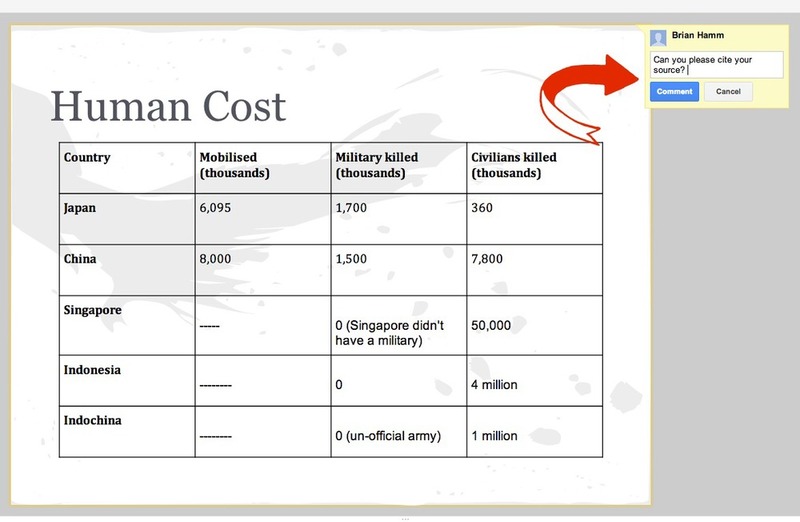 The option to add lecture and content notes to the bottom of each slide allows you to combine lecture and presentation notes and can be shared with students while they view. One way communication does not facilitate growth and learning. We are social creatures who love to communicate, the comments function facilitates meaningful, continuous dialogue that can be slide specific or general to the presentation. There is also a chat box in the right hand column that allows viewers to have a running conversation while viewing the Google Presentation. Enables viewing, editing, refining, evaluating, and collaborating, anytime, anywhere, in real time. This is where transformation happens and Google docs comes alive. Thus far we have mostly discussed entry and adaptation level applications using Google Docs, sharing rights transforms all of the functions previously discussed. Teachers and students can collaborate with anyone, anywhere. Group work has been "transformed" and redefined.